52 years, 1 month, 7 days old age. Vijay Yadav will turn 53 on 14 March, 2020. Only 10 months, 21 days, 10 hours, 21 minutes has left for his next birthday. Vijay Yadav has celebrated the total number of 52 birthdays till date. See the analysis by days count and bar graph. Vijay Yadav was born on 14-03-1967 in Gonda in the state of Uttar Pradesh, India. He is an Indian Cricket Player. After playing some memorable innings at the domestic level, he was drafted into the national squad during the early 1990s. He was an excellent wicket-keeper and was a teammate of veteran Haryana cricketers like Chetan Sharma and Kapil Dev. Apart from his wicket –keeping skills, he was a dangerous lower-order batsman and that certainly helped him to be considered for the national fold. In the 19 ODI’s that he played for India, his strike rate was over 100 and that was a rare sight during those days. Though, he did play a handful of cameos but couldn’t do much to cement his place in the side. With an average of 11.80, he was dropped from the side after the West Indies tour of India in 1994, he was never considered again. He was selected as the second wicket-keeper in the side to Kiran More. 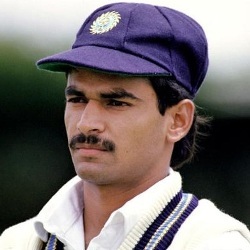 Even on his debut tour to South Africa, he was a selected as a wicket-keeper to understudy Kiran More. He played just 1 test match in his career and even after scoring a blistering 30 and some sharp work behind the stumps, he was never selected again. In a first class career of over 10 years, he has scored almost 4000 runs at an average of 36. His work behind the stump was the talking point. In 2006, he was involved in a car accident and was severely injured and also lost his daughter in that accident who was just 11 years old.